The Yamaha CP73 represents the definitive evolution of the stage piano with enhanced portability, ease of use, and state-of-the-art sound. “CP” stands for Combo Piano, and the CP lineage goes back to 1976 when Yamaha first tackled the challenge of electrifying the sound of an acoustic grand piano. Flash forward to today, where Yamaha’s advanced technology sets the standard for digital pianos in an instrument that incorporates the company’s century-plus of piano craftsmanship and over four decades of synthesizer innovation. The CP73 puts it all together, with authentic acoustic and electric piano sounds, responsive piano touch, and an intuitive one-to-one user interface. 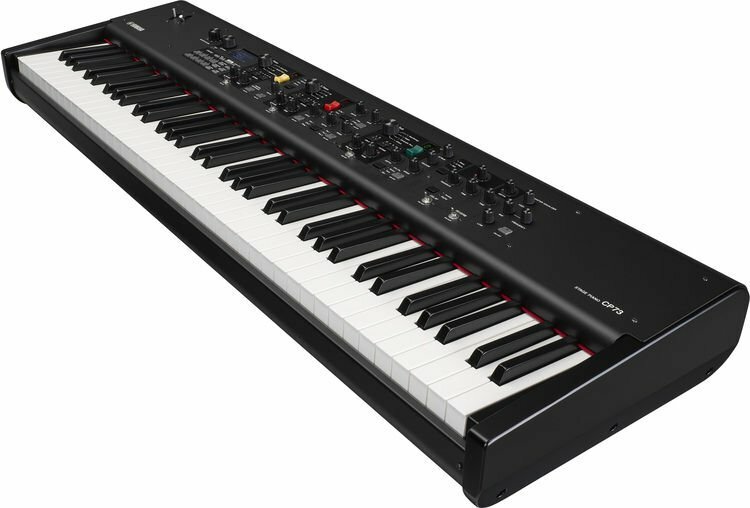 For the gigging keyboardist, CP73 features a newly designed 73-key BHS (Balanced Hammer Standard) E1–E7 keyboard with matte black keytops. 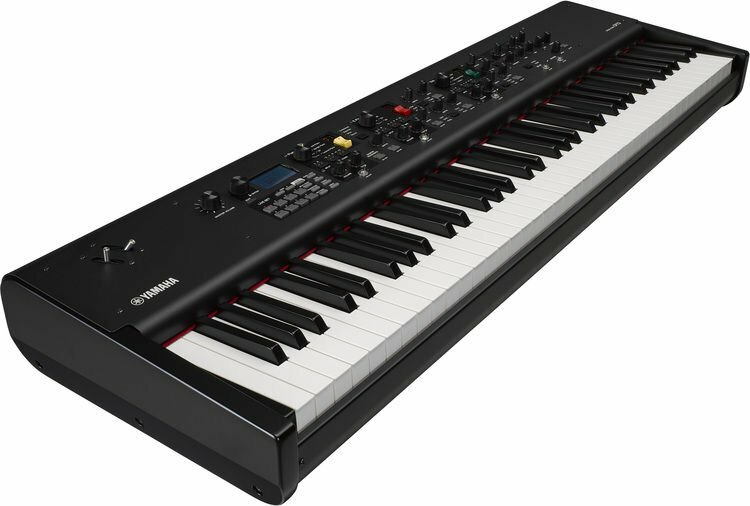 Spanning E to E, like guitar and bass, the CP73’s BHS action provides the ideal range, feel, and responsiveness for playing a wide variety of keyboard and synth sounds with a band. The Yamaha CP73 stage piano gives you three premium grand pianos: Yamaha’s own world-class CFX and S700 concert grands, as well as the inimitable Bösendorfer Imperial 290. These pianos provide full dynamic expression and nuance through meticulous recording and voicing. With over 17 years of continuous development, the CFX is Yamaha’s flagship 9' concert grand piano, and it delivers sparkling highs, crisp midrange, and robust bass with prodigious dynamic range and the volume to project over a full symphony orchestra. Handcrafted by Yamaha master artisans, the S700 has the clarity and power to cut through dense arrangements, while remaining delicate and expressive in solo and sparser musical settings. Bösendorfer is the only piano maker still building their instruments in the Viennese handcrafted design tradition. This results in pianos boasting the characteristic “Viennese Sound,” with warm bass, singing treble, and rich overtones. The 8-octave, 9.5' Imperial 290 is Bösendorfer’s awe-inspiring flagship grand. The Imperial’s extended bass range resonates with every key you strike, and its massive soundboard projects emphatically at all frequencies. When you’re working with thick arrangements, an upright piano will oftentimes be the right choice. The CP73 has two uprights onboard, and they’re no slouches. Yamaha’s flagship SU7 acoustic upright serves up rich, resonant tone, while the Yamaha U1 — one of the most popular acoustic pianos on the planet — makes its appearance as a meticulous sample of a characterful vintage U1 — ideal for any music crying for the sound and vibe of an upright. The CP73’s arsenal of vintage electric pianos kicks off with the beloved Yamaha CP80. First introduced in 1978, the CP80 was designed to cut through a live band with its wide dynamic range and fat, powerful sound. On the funkier side of things, the CP73’s 75 Rd is a funky, dirty tine electric piano dripping with vibe and character. The 76 Rd is a high-quality tine EP suitable for all music genres. The 73 Rd has a warm, mellow, vintage tine sound ideal for ballads and accompanying singers. Lastly, the Wr is a classic reed electric piano offering vintage and modern versions with broad dynamic range. The CP73 also features a wide variety of other keyboard sounds — including tonewheel, transistor, and pipe organs; clavinet, FM pianos, and more — to cover any playing style. Also onboard are synth sounds for covering any musical situation. Split, layer, and solo fat, punchy basses, searing leads, warm pads, brilliant brass, lush strings, and more. The one-to-one CP control interface gives you real-time interaction for instant sound creation. Out of the box, the CP73 delivers ultra-realistic piano and keyboard sounds — everything you need for professional recording sessions and live gigs. But with the needs of the modern musician in mind, it also features a new system with regular OS updates that will contain new high-quality content designed to complement the CP73’s original soundset.